A few days ago, I wrote about why I thought it was so important to attend yesterday's hearing "The Sale of Public Libraries in New York City" convened by the NY State Assembly's Committee on Libraries and Education Technology, chaired by Assemblyman Micah Kellner. For those of you who missed the hearing and want to see and hear for yourself what happened, keep an eye on the website of the NY State Assembly, where video of the entire session will be posted in a few days. But be prepared with several buckets of popcorn before you sit down to watch: The session started at 10:30 a.m. and went on until something like 6:30 p.m. - that's my best estimate, anyhow; I had to duck out at 5:45 at make it to Sunset Park in time to help my friend Chris Russell celebrate the official opening of his bee gates there. But the 7+ hours of testimony I heard were truly eye-opening. Four members of the State Assembly attended the hearing: Kellner, Joan Millman and Walter Mosley (representing districts in NYC) and Samuel Roberts, who traveled in from Syracuse for the day. At the opening of the hearing, there were at least 125 people packed into the Assembly Hearing Room on the 19th floor of the mixed-purpose government building at 250 Broadway. Around 50 of those present had signed up to testify, which involved registering two days beforehand and submitting twenty copies of a written statement. So it's clear why the hearing lasted so long. And while the crowd thinned out in the course of the day, quite a few attendees stayed on to the end, because the testimony being presented was pretty fascinating. The day began with opening statements from each of the Assembly members on the Committee (all spoke strongly in support of saving our public libraries from being sold off), followed by presentations by the presidents/CEOs of the New York Public Library and Brooklyn Public Libraries, Anthony Marx and Linda Johnson. 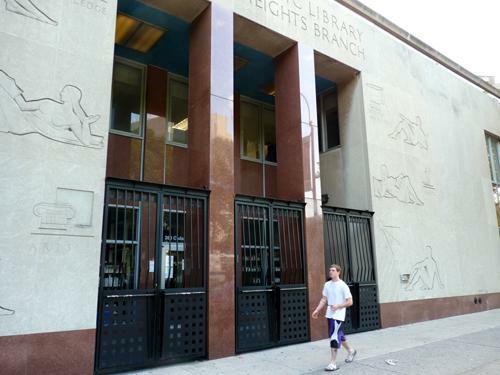 As a Manhattan resident, I hadn't been aware that the Brooklyn libraries are in just as much danger as their Manhattan counterparts, so I was surprised to hear Johnson arguing in support of closing and selling off two branches: the Brooklyn Heights and Pacific branches. On the other hand, I had already heard plenty about the controversial Central Library Plan (CLP) being championed by Marx, so his corporatese testimony defending his plans to sell off the popular and heavily used Mid-Manhattan Library as well as SIBL (The Science, Industry and Business Library) came as less of a shock. He emphasized the importance of minimizing all the "non-public spaces" in our libraries (i.e. all the spaces in which books are cared for and stored) and touted his successes in getting library patrons access to digital versions of "the entire corpus of commercial books." I was very pleased to see the Assemblymembers present take both CEOs quite aggressively to task. Assemblyman Kellner remarked at the end of Marx's testimony that it had left him "with more questions than answers," and Assemblywoman Millman (who holds a degree in library science) pointed out that the selling off of public buildings is at best "a one-time fix for a recurring capital need"; a library that has been closed and sold off is gone forever, while the moneys from its sale may soon be exhausted. The ghost of the Donnell Library hung over the day's proceedings, a grim specter. This popular five-story library at 20 West 53rd Street - just north of Rockefeller Center, whose architecture it was designed to compliment - was closed in 2008 and sold to a real estate developer that at first planned to put in a hotel but instead, after the financial crisis struck, sold it to a second developer that is in the process of constructing a high-rise condo tower on the property. Part of the deal was that any new development would incorporate a new library into its design. Indeed, a new Donnell library is scheduled to reopen in summer 2014, and it's going to be located - wait for it - in the basement. The new developers have allocated 28,000 square feet for the library (less than a third the size of the old library - 97,000 sq. ft.) and almost all of this will be distributed among the two basement floors of the building, with only an entryway on ground level So, you're thinking, clearly this enormous sacrifice of a beloved neighborhood library building must have netted the library system some big bucks, right? Guess again. As came out in yesterday's hearing, the sale of Donnell netted a paltry (in real estate terms) $39 million. The penthouse apartment in the new building just sold for more than that. The Assemblymembers referred repeatedly to the fact that the Bloomberg administration, which is on its way out, has been aggressively handing out construction contracts. They encouraged both CEOs to hold off on the further sale of library buildings until a new administration is in place; and both CEOs explained that the current climate of permissiveness suited their needs, which was why they were both hurrying to move their plans forward. In fact, the sell-off has already begun: Marx confirmed yesterday that five floors of SIBL had already been sold for $60.8 million, quite a bit less than the $100 million the NYPL spent acquiring and renovating the building in 1996. (For background on the construction and sale of that library, see the Noticing New York website.) The ghost of Donnell still walks among us. Oh, and let me throw in some book math. Yesterday Marx estimated the collection of the Research Library as containing 8.2 million volumes (half of which are currently housed in off-site storage in Princeton, New Jersey). The Mid-Manhattan Library and SIBL together have another million, Marx said, and the new stacks that are tentatively planned to be built under Bryant Park (possibly pending a structural review?) will hold 3.2 million. This means that the number of books on site at the research library will drop by roughly half under the CLP, assuming it really is possible to house that many books in the new under-the-park stacks. So if you're doing research at the Research Divison of the library, many of the books you request will involve a waiting period of probably three days (since that's the length of time I've generally had to wait to receive books from the library's off-site storage). Marx keeps saying off-site books will arrive in 24 hours, but given past performance, I wouldn't be so quick to believe that claim. As the hearing progressed, it soon became clear that our libraries have strong advocates both in the State Senate and on the City Council. Senator Velmanette Montgomery has been an outspoken supporter of beleaguered Brooklyn libraries ("The sell to save mentality is something we should get away from"), as are Councilmembers Letitia James ("Selling off libraries diminishes democracy") and Stephen Levin ("Public land is not there to be sold off for profit - that is not its purpose.") I hope their advocacy will be successful. Meanwhile the rest of the hearing demonstrated that the elected officials who are fighting to save our libraries have a lot of citizen backup. The two groups Citizens Defending Libraries and Committee to Save the New York Public Library each sent a number of speakers to testify, as did the Historic Districts Council, Society for the Architecture of the City, Harlem Historical Society, Defenders of the Historic Upper East Side, the New York Landmarks Conservancy, the Park Slope Civic Council, Carnegie Hill Neighbors and Save the Pacific Street Library. There were also a number of scholars and authors (many of them with prizes like the Pulitzer and National Book Award under their belts), several retired librarians (those currently employed are apparently afraid to speak out) and a land use attorney. If I understand correctly, the written testimony submitted by each speaker will be made available on the Assembly website. I'll add a link at the bottom of this post as soon as the information is available. To start with, here's the list of speakers. 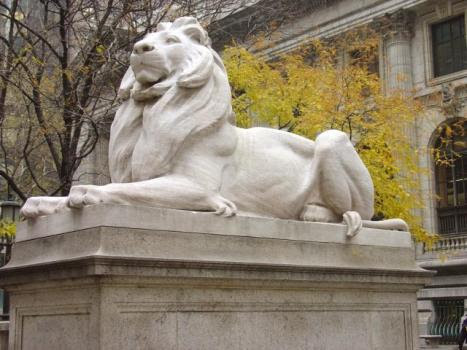 Christabel Gough, Secretary of the Society for the Architecture of the City, noted that the NYPL website prominently announces "Landmarks Preservation Commission Votes in Favor of Central Library Plan." The claim, Gough said, is misleading, since the Landmarks Commission rules only on the exteriors of buildings declared historic monuments and has nothing to say about interior renovations. Assemblyman Kellner noted that approving the interior renovation plans of historic buildings fell under the auspices of the New York State Historical Preservation Office (SHPO). Gough added that the Buildings Department has already issued seven permits for the construction work on the library. Architectural historians are particularly concerned, she said, about the plan to demolish the stacks - the books have already been removed from them in preparation - because in a stunning instance of form following function, the original library building was designed in such a way that the stacks physically support the Rose Reading Room. Isn't that amazing? I had no idea. Marx explained in his testimony that the engineering firm Sillman and Associates was going to take over the job of removing the structural support from beneath the Reading Room without any damage whatever to the room itself (which, unlike the stacks, has been declared a historical landmark). Does that sound to you like a good idea? Meanwhile in Brooklyn the Pacific library is under fire, as Therese Urban (and others) testified. Built in 1903, this is one of the earliest historic Carnegie Libraries in New York City and was the only one of them to be designed specifically as a children's library with a unique configuration of stacks (the building is rectangular in front, semi-circular in back) arranged to allow a librarian to easily keep an eye of what all the kids in the back were up to. Brooklyn Public Library President Linda Johnson testified that closing this library would have little impact, as she is supporting the construction of a new library just south of BAM a few blocks away. But as a number of horrified Brooklynites pointed out, getting to this new location from the old one would force children to cross one of the most dangerous intersections in the entire state (Flatbush Ave where it crosses Atlantic), which has a shockingly high incidence of pedestrian accidents. Despite this danger, Urban said, there are strong indications that the Pacific Library will be going the way of Donnell: the building occupies 1/3 of a city block, and the other two-thirds have been leased by the city; these leases expire in two years, just when the BPL is hoping to close the Pacific Library for good. That means that this entire city block in the middle of downtown Brooklyn will be available for lucrative high-rise development at that time. This all makes perfect sense in terms of a real estate investment; the only question (given the NYPL's recent record) is who exactly will profit from such a deal if indeed it is forced on us. As Patti Hagan of Citizens Defending Libraries pointed out, the developer Bruce Ratner (who apparently already owns 22 acres of property in downtown Brooklyn) has expressed interest in acquiring this block as well. site at 280 Cadman Plaza West." So it's actively on the chopping block as we speak. The grounds for the sale? The air conditioning is broken, such that the library is forced to close on hot days. And the BPL claims that repairing or replacing the system would cost too much. As Rita Bott testified (she's a retired librarian who used to work on 53rd St.), this is exactly the same rationale that was used in 2008 to justify the closing and sale of the Donnell branch. Which pretty much everyone (even Anthony Marx) is now willing to admit was a complete boondoggle. Some of the most alarming testimony came from land-use attorney Michael Hiller, who specializes in protecting public property from private developers. He said that a construction project like the CLP (a "Type 1 action") requires an environmental assessment and environmental impact statement to be made publicly available before any sort of work is allowed to begin, but when he asked to inspect the paperwork for the CLP at the Department of Buildings, he was told that the papers had been sealed with a waiting period of several weeks to several months because the library was a potential "terrorist target." Meanwhile the statute of limitations for registering objections to an action is 120 days. Which means that the CLP might be able to go ahead without appropriate review unless the paperwork is quickly made available. Assemblyman Kellner promised to look into this quickly. Several times during the hearing, Assemblyman Kellner reiterated: "This is just the first hearing. There will be others." He also pledged to tour the Brooklyn libraries threatened with closing to draw his own conclusions as to their purportedly terminal obsolescence. I'm so grateful for his engagement with this issue. I think it may have something to do with the fact that when he was a kid (as he confessed at one point during the hearing), his neighborhood library was the Donnell branch. Oh, and just for the record (and thanks to Therese Urban for pointing it out), kids don't like digital books. They want books printed on paper, with pictures. And as Paula Glatzer pleaded, remembering how Penn Station (the beautiful old one) fell victim to real estate developers and "progress": "Don't let our children ask: Where were you when we gutted the lion library?" How about we band together to save it instead? Postscript: A reader just drew my attention to this New York Times article from 1987 announcing plans to build stacks beneath Bryant Park. Construction on these stacks was completed in 1989. This means that my "book math" is off - the CLP would mean moving even more books to New Jersey than I calculated above, since some of the research library's holdings are already stored under Bryant Park. In another correction: the Rose Main Reading Room isn't yet officially landmarked, though efforts are underway to secure landmark status for it.